Is Your Phone Disconnecting You from the World? The cell phone started out as just that – a telephone. 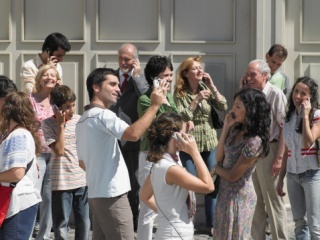 Cell phones allowed everyone the freedom to talk on the telephone whenever and wherever they pleased. But, as you know, the cell phone became more sophisticated very quickly. Software was developed so that cell phones could be used for e-mail and texting. And soon after that, cell phones became complete computer systems – with Internet access which included all of the domains and apps available on any other computer. Let’s just go ahead and admit it – we love our cell phones. And this includes all of us. In the twenty or so years they have been widely used, they have become such an integral part of society that most of us cannot even imagine how we would function without one. And cell phones are indeed very useful. We can reach anyone at just about any time. This includes our parents and others who may want to know we made it “safe and sound” to our destination. Or, on the other hand, if we experience an emergency, 911 and professional assistance are only a few clicks away. In addition to our calls/conversations, we use our phones to stay in touch via e-mail or texting. And we can use the Internet for a host of things, keep up with homework assignments, perform research on an almost unlimited number of topics and to keep up with the important news of the day. With all of these pluses, it’s almost impossible to think that “this little tool” could also hurt us in a number of ways. Are You Overloading Your Life with Phone Time? There was life before cell phones. Entire conversations often took place face-to-face. Whether you realize it or not, you are able to communicate with everyone in your inner circle without having to constantly text or engage in social media. So, make yourself some cell phone rules. Establish what works for you rather than becoming a slave to your cell phone. Never write or forward a photo, or anything in a text, that you wouldn’t want forwarded to everyone in your school, to your teacher/principal and to your parents/friends. Have a life “outside” of your cell phone. Don’t keep constantly checking it and don’t feel obligated to respond to texts right away. Instead, wait and respond when it is convenient for you. Nothing replaces F-2-F. Keep in mind that the best conversations are those you have face-to-face. Do not let texting become a substitute for this, or you will miss a lot of fun talks and beneficial conversations. Show respect for the people around you. Use etiquette and common sense when using your cell phone. In other words, do not text during meals, or while you are having a conversation with another person. And turn off your phone when you go to bed – you deserve and need to get a good night’s sleep. Like most everything else, cell phone usage can become an obsession and we can spend too much time using them – they can become invasive of our lives. Everyone thought the television was wonderful until we found that a lot of Americans were watching television when they should have been exercising, completing a special project around the house or even doing their homework. Cell phones are just like many devices – when used carelessly or to excess, they become more harmful than helpful. When used at the wrong time, cell phones can be downright dangerous. The U.S. government has collected some alarming statistics regarding distracted driving. Distracted driving includes any activity that diverts attention away from the main task of driving. Chief among the distractions are talking and texting on cell phones. 10% of all drivers under the age of 20 involved in fatal car crashes were distracted at the time of the incident. And this group comprised the largest group of people who are distracted drivers. 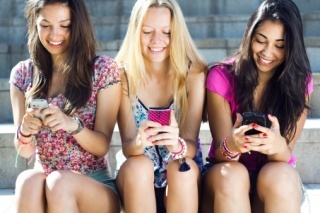 25% of teens have admitted to responding to at least one text message each time they drive. The CDC confirmed these statistics and also noted that each and every day in the United States, on average 9 people are killed and over 1,000 are injured in car crashes involving distracted drivers. Obviously, you should not use your phone for any reason while driving. Whatever the matter is, it can wait. If it’s urgent, pull over and stop your car while you talk or text. Following this simple rule can save thousands of lives…possibly yours included. Phone ownership statistics show that over 60% of us now have smart phones and the trend of increased functionality within our phones is expected to increase…larger screens and more storage are making our phones even more important tools in our lives. The iPad, and devices like it, have reduced our need for laptops…and our phones are now moving into this space. Bottom line…we’ll see more phone usage, not just for calls and texting, but also for accessing information and performing other tasks via the internet. As a result, responsible phone usage is becoming more important. Some forecasters are predicting that our society is changing from a top down direction to more of a bottom up influence on matters of importance as individuals network to make their interests known. As a result of this increasing power within the ranks, young people (and adults, too) need to be mindful of this change and to make sure they’re using their phone’s functionality in a responsible way. Using a phone six to eight hours per day – on average about 45 hours per week as reported by a number of reliable sources – seems like a lot to us. But, we here at Good Choices Good Life aren’t going to take a position on how much time is too much. This is a choice that you need to make for yourself or rely on your parents to decide. It seems to us that it depends in great part on what you’re doing with that time. As you know, there are good things and bad things that you can do on your phone. If you are devoting any time to the latter, please don’t think you can do so without it impacting you in some way. Let’s talk about a few of the bad things. What You Think. In a recent survey commissioned by The Atlantic magazine and The Aspen Institute we see some hints of what is influencing this early generation of Internet users with regard to values. Most young people say that the Internet is shaping who they are. On a question that asked people to rank different sources of influence on their sense of right and wrong, 59 percent of individuals ages 18 to 29 said that social media or the Internet had a "great deal" or a "fair amount" of influence on their lives. These stats reveal a picture of a society just beginning to display the Internet's role in its culture, producing a generation that technology has substantially shaped rising into prominence. While the young people who participated in this survey still ranked family and education at the top of their “list of influences,” it is clear that information coming via the Internet is playing a larger and larger role in who young people are today. If you are a young person reading this post right now, this is, in effect, an alert for you. You may not feel that the Internet is shaping your life, but it is to some extent. The growing challenge for you is to be able to separate the good from the ugly so that you can develop your own ability, aided by your family and your education, to decide right from wrong and what truly is best for you. Opinion vs. Fact. The last point here is an extension of the point made above, namely that the Internet influences most young people “a great deal.” One of the things that I remember my grandmother teaching me was characterized by her words…“consider the source.” In other words, she knew that I was going to be influenced (during my teenage years) by lots of different people, as she said…“some good and some bad.” She was teaching me with these simple words that I should stop and think about the person who was stating their opinion in such an influential way…was it a good person or a bad person? We have a way of accepting the words written on the Internet, these presented here included, to be facts. In reality, the vast majority are just opinions, viewpoints of people who may be knowledgeable and trustworthy, or who may not be. The choice that you as a young person must make as you surf the Internet is who will you let influence and shape your life. I’m 71 years old as I write this (you may wonder, what could an old guy like that really know? ), and I will tell you this from experience…there are a lot of people in this world who think they know, but who don’t have a clue concerning how to build a full and meaningful life. Stay on alert, keep away from “the bad folks” and work a little harder to find “the good people” who can help you grow, develop and create a life that is helpful to others. Today we have more information at our disposal than ever. But this information can become hurtful or dangerous if accepted without much thought…without really making a choice as to how it might be of benefit to you. Please use common sense when using today’s cell phones and the internet. Don’t let a momentary temptation cause you to make a bad choice.